Fleetwood Mac News: Video: Christine McVie Intro'd by Mick Fleetwood + "Get Like You Used To Be"
Video: Christine McVie Intro'd by Mick Fleetwood + "Get Like You Used To Be"
Here's a short clip of Mick Fleetwood introducing Christine McVie in Maui on Feb 13th + Christine singing the beginning of "Get Like You Used To Be" which she's probably not done live since I'm guessing the early 70's! Thanks to Tom Clark for the video! The full version of "Don't Stop" and "Get Like You Used To Be" at the bottom. A different perspective of Christine McVie performing with Mick Fleetwood's Blues Band Feb 13th. Thanks to heilemaile for the three videos shot from behind... Just tremendous! 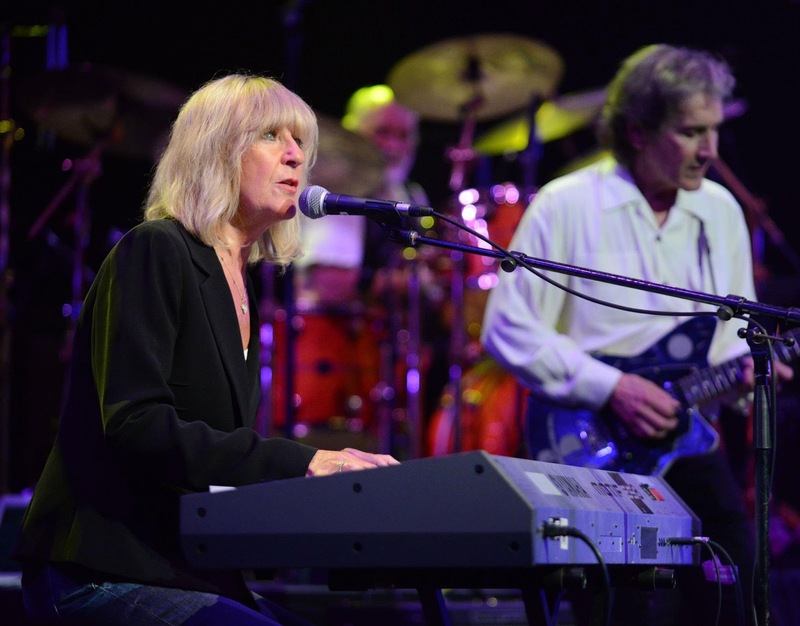 "Get Like You Used To Be" Christine McVie. First song played live this night. "Rattle Snake Shake" Steven Tyler on lead vocals. Oh Chris, you mean so much to us! Even though her voice has obviously deepened, she sounds soooo good! And she's got a bit more of a vibrato thing going on. Such a lovely lovely voice. So warm. "Get Like You Used To Be" ... sublime. Where's Stan Webb? I don't understand why everyone attacks Stevie and her voice - has anyone listened to Christine's? I don't read any vicious comments about her voice or how she looks. ^^ Because Stevie Nicks often plays it safe with one note, no range, and zero effort - and the fans act as if it's the same as ever despite having In Your Dreams as evidence to suggest otherwise. Some fans tend to be more critical of Stevie as well because there's a trend in the fan community to silence anyone who brings a negative opinion to the table. This attitude of absolute devotion sometimes leads to fans (and yes, they are fans) having to be more direct and often harsh in order to be heard at all. Christine's voice is basically the same today as it's ever was but just aged a little. Very nice of you to go about defending Stevie by criticizing Christine, though. Class. That's really great. How much fun for them! Yes, Stevie fans can be a little on the harsh side when anyone says anything "negative" about her. I worship Stevie, but I continually have to remind myself that she's just a woman whose had an extraordinary life and a great talent. Do I like everything she wears? NO. Do I like everything she does? NO ("You Can't Fix THIS"). But I do love her. Christine just doesn't have the legion of die-hards like Stevie has. But her contribution to music shouldn't be overlooked just because Stevie's shadows towers above everyone else. All mac fan love chris but when u are out of the lyme life for that period of time and never did have a magor solo career then it is what it is. Stevie has worked hard to be were she is today. "But her contribution to music shouldn't be overlooked just because Stevie's shadows towers above everyone else." It doesn't. Her career is a mess right now. It's just the brainwashed fans refuse to admit it. It's over. Fleetwood Mac is also over. All living on past glory. "Stevie has worked hard to be were she is today." Where is that exactly? Arm waving on Letterman? Stevie has been working hard - regardless if you like the output or not. Incessant touring for the past few years. You can't really put "You Can't Fix This" in a 'working hard' category. It's the worst song of her career and makes Gangnam Style look like the work of Shakespeare. Interviews, thinking, and sitting. LB will do the songs, SN will back them up. If there's a new SN track it'll be played once in the setlist and then abandoned for Landslide or Dreams as is always the case. And re-releasing Rumours could be done with their eyes closed; they've shamelessly released it about 40 times already. In my opinion Chris sounds great, and so does Stevie! I've never heard women in their 60s sound this good! To the critics, even measure-perfect recipes can taste AMAZING to one person and AWFUL to the next! I appreciate the other opinions out of fair-and-square individuality, but always remember what it boils down to is it's just one opinion. Christine's signature woodwind voice will always be gorgeous, as will Stevie's gorgeous alto-sax voice! I have to interject here that Lindsey has kept up and even exceeded past musical achievements in more recent years. UNDER THE SKIN, GIFT OF SCREWS and SEEDS WE SOW were all outstanding, critically acclaimed albums with some wondrous and amazing songs. He has a wife and kids and Fleetwood Mac is his day job, which he elevates tremendously with his serious and hard-working approach. If Lindsey had his druthers, Fleetwood Mac would have a dazzling new album to convince the world that they're not dinosaurs, but Stevie can't or won't cooperate. Since she's convinced herself that IYD was a commercial failure (it wasn't if you look at Madonna's numbers) she seems to have grown indifferent to the prospect of making music with Fleetwood Mac. I'm very frustrated with her attitude (though I love her) and I'm sick of hearing the same songs and stories recycled 1,000,000 + times, which is what this Oprah baloney is all about. It's particular painful hearing her sing the classics in her strained, tour-damaged voice. It's getting to the point where I cringe in anticipation before her live performances. And if YOU CAN'T FIX THIS is any indication, perhaps she's right to close down the song factory. We longtime fans have watched Stevie evolve from the beautiful, intense, profoundly creative young woman bathed in blue light on the cover of BELLA DONNA to everyone's favorite motormouth rock and roll auntie with a throaty laugh and a bossy side. Maybe Stevie needs to reconcile her old and new selves to really move forward. Sorry but I find it hilarious that people can be so childish as to argue about the pros and cons of these artists at this point in time. Essentially, neither have the same voices or appearance as they did 30 years ago - NO ARTIST DOES! But why should that matter? People are allowed to get older and to change, and if you're not keen on that change then just walk away from it. People seem to behave as if they are morally obliged or forced into defending artists - that's the artist's own job I'm afraid, and anyone assuming that role is merely being somewhat deluded, and a little pathetic. At the end of the day, we all have our own tastes and it really shouldn't become a contest in trying to force those views onto other people. Who cares if people love or loathe Stevie Nicks? As an artist, she should be very used to drawing admiration and criticism from people around her, and I'm sure she'd be the first to concede that not everyone is going to like what she does or the way she does it. Get over it I say and live and let live!